On Thursday, Mike Pompeo, current director of the Central Intelligence Agency, has his confirmation hearing for Secretary of State. This is truly a nightmare. Luckily, there’s a mechanism to stop him—he needs the Senate’s approval. The Senate Foreign Relations Committee is voting on Thursday to confirm or oppose his appointment. And that’s where you come in. Give these senators the wake up call they need. Better yet, call them and your senators. 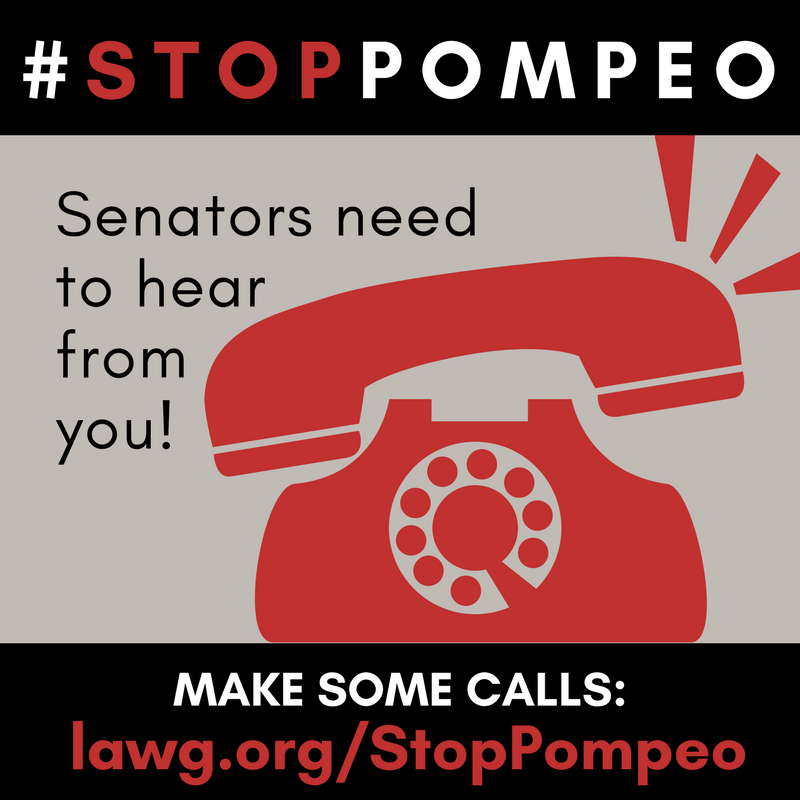 We need to sound the alarm on all fronts and demand they #StopPompeo. Trump’s appointed and nominated a terrifying trifecta. And now it’s up to you to stop it. A Pompeo-Bolton-Haspel combo, paired with Trump’s own impulsive outbursts, is a recipe for aggression. There’s no time to snooze. It’s your last chance to stop Pompeo and put this to rest. Can you call your senators and some members of the Senate Foreign Relations Committee? “Mike Pompeo’s confirmation as Secretary of State would pose a real threat to human rights and peace around the world. His record of cosponsoring anti-refugee bills and his positions against LGBT and women’s rights could have a negative impact on discrimination internationally. I fear his general approach towards Latin America will revert to a focus on the drug war, threats, and military might rather than on humanitarian needs and human rights. We want diplomacy, not war. Now that you’ve called, reach them and your network on Twitter, Facebook, and Instagram!